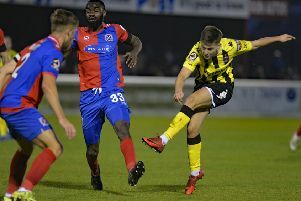 AFC Fylde boss Dave Challinor was left to rue two points dropped following Saturday’s 2-2 draw with Sutton United. The Coasters had led twice through goals from Andy Bond and Gime Toure, the latter coming on 81 minutes. They were unable to hold on with Kieran Cadogan earning Sutton a point following Bradley Pearce’s earlier goal. “It was never going to be a great game, conditions were difficult, and a game that probably suited them more than us in terms of the style,” said Challinor.